CASTINE, Maine - Plans are well underway for a family-friendly cultural celebration that will span five days, July 11-15, 2015, as the seaside town of Castine, Maine, welcomes the replica 18th-century historic frigate the Hermione, set to arrive on Bastille Day, July 14. Castine is the last port of call for the Hermione in the United States. The vessel will be stopping first in Yorktown, Virginia, and then moving up the eastern seaboard to Washington D.C., Alexandria, Annapolis, Baltimore, Philadelphia, New York, Greenport, Newport, Boston, Castine, and finally Halifax, Nova Scotia, before heading back to France. In anticipation of the arrival of the Hermione, Castine's celebration will kick off on July 11 with the official opening of an exhibit educating attendees about the adventures of the replica frigate in Penobscot Bay and beyond, housed at the Castine Historical Society, the designated host of the Hermione's visit. As the weekend unfolds, interactive workshops, storytelling, and swashbuckling nautical film screenings will be held around the Town Common; historical and maritime lectures will be hosted at the Maine Maritime Academy; and Fort George, a Maine historical gem, will be the location for Revolutionary War reenactments. The celebration will continue on the waterfront Bastille Day, July 14, and July 15, as a parade of boats accompanies the Hermione along Penobscot Bay and into port. The waterfront festivities will feature the many traditional Maine groups (Acadian, English, Franco-American and nautical), music and dance performances, local artists, fireworks, local cuisine, foodways and a marketplace of vendors, including Castine merchants and Maine-made products. 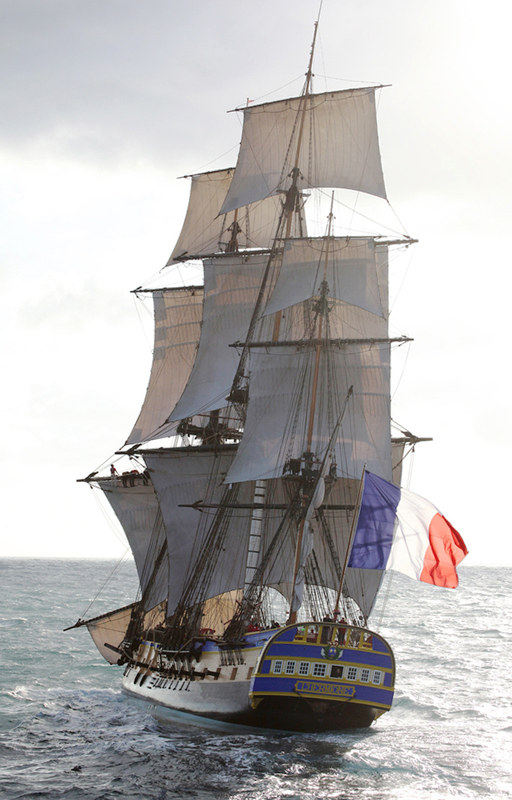 Ship deck tours and chances to meet the French crew of the Hermione will also be available. Be sure to visit the website for updates and information on area accommodations, news and a list of events taking place from July 11 until the Hermione sets sail on the morning of July 16;www.castinehistoricalsocietyhermione.org. Editor's Note: Click on the image above or the link below to access a downloadable version. Additional images are available. In 1780, the Hermione sailed from France to Boston. The voyage took 38 days. Aboard the ship was the Marquis de Lafayette who was bringing word of French military support for the American Revolutionary War. After delivering Lafayette to Boston, the Hermione sailed north to Penobscot Bay on a reconnaissance mission to gain knowledge about the British occupation of Penobscot (present day Castine). This region was pivotal in the struggles between England, France, and the Netherlands during the 17th and 18th centuries. The rebirth of the Hermione began with an idea more than 20 years ago and became a reality, thanks in part, to crowd source funding from thousands of French citizens and Friends of Hermione-Lafayette in America. The 216-foot three-masted frigate was built using 18th-century shipbuilding techniques by artisan craftsmen from throughout Europe. A ship of this type has not made an ocean voyage in the last two centuries. For more information about events in Castine, please visit www.castinehistoricalsocietyhermione.org. 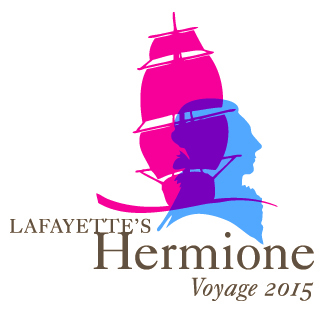 For information on the voyage and special events scheduled at each port during 2015, please visitwww.hermione2015.com.